Her Forever Hero by Melody Anne is the third book in her Unexpected Heroes series. I read book one but someone missed book two but decided to jump ahead and read this since it worked for Take Control and fulfilled my Xoxpert read for March. 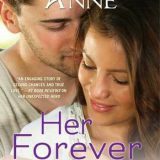 .Her Forever Hero delivered a second chance romance filled with suspense, growing pains, and growth. Her Unexpected Hero by Melody Anne the first in her Unexpected Heroes was a delightful surprise. Heat, secrets, and small-town charm made this contemporary romance a pleasure to read. Melody Anne is a new to me author, and this series is a spin-off to her wildly successful Billionaire books. Don’t let that stop you from diving right in as I found myself perfectly at home.